I am using Xubuntu 15.10 as the Guest in Virtualbox 5.0.8 r103449. This happened after a recent Xubuntu update. Same for me. Also affects (at least) kate and konsole. In kate all icons in the toolbars are missing. dolphin4 and konqueror are not affected. I noticed this after upgrade from xubuntu 15.04 to 15.10. I have reproduced it in a fresh install of xubuntu 15.10 in a VirtualBox. The icons are missing only in a xubuntu session with xfce4, but in a plasma session everything is fine. So this does not seem to be caused by a missing package. My impression is that the affected KDE applications now rely on Qt5's QIcon::fromTheme(...) to locate the icons. This is in line with the documentation of KIconLoader::loadIconSet(...) (from source package kiconthemes_5.15.0-0ubuntu1) that says: "@deprecated use QIcon::fromTheme instead, which uses the iconloader internally". But it seems that Qt5 only supports the very basic 'hicolor' icon theme when not running in a KDE or Gnome session. The method themeHint(ThemeHint hint) of the classes QKdeTheme and QGnomeTheme support the hint QPlatformTheme::SystemIconThemeName, whereas the implementation of this method for the class QGenericUnixTheme does not support that hint (soruce package qtbase-opensource-src_5.4.2+dfsg-2ubuntu9, file src/platformsupport/themes/genericunix/qgenericunixthemes.cpp). Therefore, I assume, the systems falls back to the fallback theme 'hicolor' using the hint QPlatformTheme::SystemIconFallbackThemeName. It seems that 'hicolor' lacks of most icons needed by kate and the other applications. So it possibly requires a change in Qt5 rather than in specific KDE applications or the KDE framework to get the icons back in these applications when running in Xfce. Then I started kate, konsole, and dolphin manually from a terminal window and they had most or even all of the missing icons back. When started them from a launcher (from the panel in my case), the icons were still missing. Now, after a fresh login to Xubuntu, the affected applications have most or all of the missing icons, regardless of the way I start them. On the downside, now some other icons are missing. For instance, the application icons of konqueror, kate, and other KDE applications are missing in the launchers and in the Whisker Menu. But for the time being I prefer to have a usable kate and happily accept some missing application icons. On Xfce, try installing libqt5libqgtk2 package, it should fix the issue. Yes, it works. Thanks, Dmitry! You made my day! I see that libqt5libqgtk2 is suggested by libqt5gui5, which in turn is required by kate, konsole, dolphin, and such. Now, on Xubuntu, where I assume that usually Xfce is the preferred desktop enviroment, it does not make much sense to run these applications without libqt5libqgtk2. I wonder if there is a chance to make it a dependency or recommendation of some other Xfce- or KDE-related package - without doing too much harm to those who don't use these applications on Xfce. After all, it would be nice to avoid icon-less KDE applications right from the start. We are going to make that package a recommendation (so that it will be pulled in by default) with Qt 5.7, where it has been ported to Gtk+3. FGodard (irgend-launchpad) is right that installing libqt5libqgtk2 only partially solves the problem. Search and Replace icons are still missing in Kate, and so are some of the icons in the save dialog box. I can confirm that unfortunately kate lacks of the search and replace icons, unless I switch the system from the icon theme "elementary Xfce darker" to "Oxygen". Now everything looks quit KDE-ish and less Xfce-like. After looking into the implementation of libqt5libqgtk2, I have additionally installed kde-config-gtk-style and made the following settings to get the search and replace icons displayed in Kate. Also the save dialog looks good, but I did not check it before this change. * Xfce Settings >> Appearance >> Icons -> "elementary Xfce darker"
* Xfce Settings >> KDE System Settings >> Icons >> Icons >> Theme -> "Oxygen"
- Icon theme -> "elementary Xfce darker"
- Fallback theme -> "Oxygen"
So far this gives the best appearance since I upgraded from Xubuntu 15.04 to 15.10. @milasudril, good point! "KDE System Settings" is in the package systemsettings. Since plasma-desktop depends on systemsettings, I had already installed it and did not mention it. You can find it in the "Xfce Settings" or start it directly as /usr/bin/systemsettings5. @Andrii Senkovych (jollyroger), where can I define XDG_CURRENT_DESKTOP=gnome? I put it in ~/.bashrc and it did not help. Workaround from Comment #16 helps a lot. But I had to install plasma-desktop. Just installing system settings did not work. This bug still exists in 16.04 (Xenial Xerus) Beta 2. I am on Kubuntu 16.04. ** Xfce Settings >> Appearance >> Icons -> "elementary Xfce darker"
** Xfce Settings >> KDE System Settings >> Icons >> Icons >> Theme -> "Oxygen"
I saw this bug in Kate and in Gwenview (and probably other KDE apps). Most buttons had no icons at all for me. I had used Menta from MATE as icon theme. The last comment fixed it. Particularly, selecting "Oxygen" as theme in "KDE system settings" (step 3 above) helped. b) There's already the concept of a fallback theme. Set dependencies / install scripts to ensure that the fallback theme contains all icons for all apps, including KDE apps. I cannot find "Icons" in "Xfce Settings >> KDE System Settings". Any hint? I'm running Linux Mint 18 Xfce 64 bit. > I cannot find "Icons" in "Xfce Settings >> KDE System Settings". Any hint? In my (quite outdated) Xubuntu 15.10 I see the "Icons" in "KDE System Settings". It seems, it uses the packages plasma-desktop and libkf5iconthemes5 (amongst others). Do you have both installed? Thanks for the hint. Now the workaround worked! In my case, using Bodhi Linux 4.0, the solution was installing kde-config-gtk-style and libqt5libqgtk2, AS WELL AS adding the line XDG_CURRENT_DESKTOP=gnome to /etc/environment. Without that line, did not matter to have those two packages installed. I did not have to install systemsettings package because the Moksha desktop includes a config app to choose the main icon set. Is there a way to solve this without hacks? I had installed Ubuntu Studio 16.04.3 recently after using an upgraded 16.04.2 on the same computer. I had previously installed a full KDE desktop on top of Ubuntu Studio 16.04.2 and had the same problem reported here, but I was able to get the icons to show by using the /etc/environment XDG_CURRENT_DESKTOP="KDE" workaround. After some unrelated issues with full KDE on 16.04.2 I decided to go back to square one and install Ubuntu Studio 16.04.3 from a downloaded ISO. I decided not to install the full KDE desktop but to only install the KDE apps I like to use, Konsole, Konqueror, Dolphin and a few others. Everything works except most of my favorite KDE apps are not displaying any icons. Konqeror seems to be only missing icons on the splash page at start up but displays toolbar, side panel and folder icons using what appears to be Breeze icons. Kate displays icons in the side bars but not the toolbar. Dolphin displays no icons at all except a single icon in the info panel that represents the currently selected item. 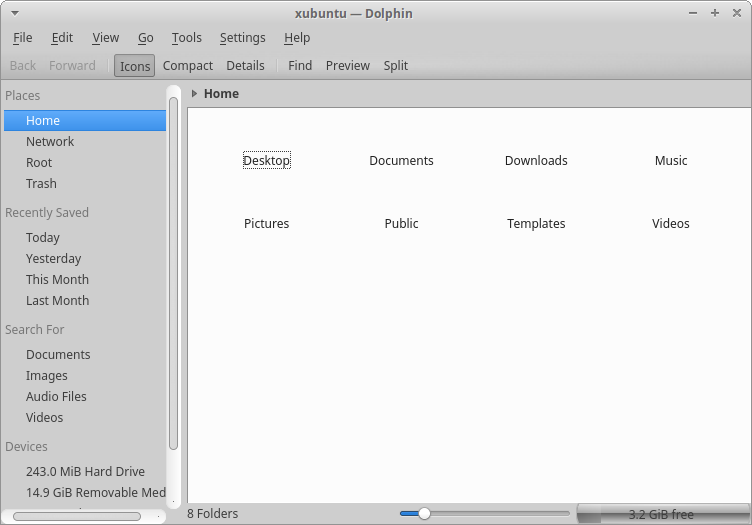 Also of note is Dolphin displaying icons of folders that contain one or more images. These icons also look like they are Breeze icons with up to 4 tiny thumbnails of the images in the folder. Since in 16.04.2 I was able to restore views of icons with the /etc/environment workaround it was the first thing I tried, but though it worked before it failed to work in my new 16.04.3 desktop where I did not install the full KDE Desktop. I did extensive research, installed all the recommended files, edited configuration files, and none of the workarounds found here or any other sites have given me a fix or a good workaround. If anyone is interested in more detail of my situation, upon request I will make more information available. I created a new Icon set by mixing up Lubuntu and Oxygen, to keep Lubuntu's look and feel and allowing Dolphin to run with all its icons. The folders for "mimetypes" are all Lubuntu, the folders for "places" is mostly Lubuntu. And the rest are from Oxygen. I called it Lubuntu Dolphin, the name can be changed in the index.theme file. The "Lubuntu Dolphin" folder should be placed in /usr/share/icons/. Thank you for reporting the bug regardless. > Lubuntu. And the rest are from Oxygen. > The "Lubuntu Dolphin" folder should be placed in /usr/share/icons/. > ** Attachment added: "Lubuntu Icon set which is compatible with Dolphin"
> Bugs, which is subscribed to kate in Ubuntu. I am not reporting a bug, the bug has been reported, I am replying to it. As far as I can tell the Icon Set that I uploaded can be used by all versions, so it is as helpful here as it would be at Lubuntu. > I am not reporting a bug, the bug has been reported, I am replying to it. > versions, so it is as helpful here as it would be at Lubuntu. The attachment "Lubuntu Icon set which is compatible with Dolphin" seems to be a patch. If it isn't, please remove the "patch" flag from the attachment, remove the "patch" tag, and if you are a member of the ~ubuntu-reviewers, unsubscribe the team. Thank you for the workaround in comment #16 - krusader and kate are a lot easier to use now. Still present in 18.04. Installing Oxygen theme and systemsettings and setting substitutions icons to oxygen solves the problem. TODO: Add to some package configure script! however, after setting fallback to oxygen, the xfwm4 is keeping to have SIGSEGV.